As the ARE’s Brave the Blizzard update puts it, “We have been trying to put on a snowshoe race in a blizzard for 14 years now. We’re 0% on that. 50% on having snow. 100% on fun.” And so it goes…. At any rate, this year’s BTB might go down in history as the only trail race that was actually tougher than a snowshoe race in deep snow. In 2016 I smugly wore my faithful Ice Spikes and proceeded slippage-free. This year was the first time ever that my Ice Spikes came up short, and not in length. The unavoidable remnants of snow were slushy and sticky and clumped to my soles like snowballs, which, of course, they were. Around me, others were reaching similar conclusions. Jamie Howard jettisoned his microspikes early on and after his first fall (of several) wished he had gone with his screw shoes. He felt much better afterwards (mentally, not physically) when I enlightened him with my experience. The 2018 trail was also different from the 2016 trail in that instead of ice sheets which perform well with traction, the course was basically some snow with soggy grass plastered with mud. Think of those greasy, slicked-down Elvis hair styles. Except for the very steep climbs, where the terrain quit fooling around and dished out pure mud. Either way, mud or snow, there is literally no way to train properly for this race unless you set your treadmill at a 70 degree angle sloping to the left. And who runs like that? This sloping occurs twice on the golf course area. Going out it is merely amusing, but on the downhill return it is a different matter entirely. As I write this I am icing (brrr!) my ankle, sore from twisting my right foot inward. 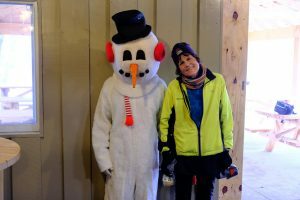 — Laura Clark is an avid snowshoer, trail runner, XC skier, race director, and 2017 World Snowshoe Federation Championship 70-99 Female Age Group winner.